Who Does Ahnsahnghong Say Is The Bride? “The Spirit is our Father, and the bride is the wife of our Father, so she is our Mother.” © WMSCOG English WATV.org – Accessed on 05.13.2011. The WMSCOG believes that the bride refers to the “mother god” and not to the church despite the Bible’s explicit teaching that the bride is the church. But what does the Korean man named Ahnsahnghong, who founded the WMSCOG (and whom they believe was the second coming of Jesus), believe the bride is? Who Is The Bride According To Ahnsahnghong? Adam and Eve were husband and wife. If Jesus is the last Adam and the saints are the last Eve, the Church is the Bride! If Ahnsahnghong’s writings support that the bride represents the church, why does the WMSCOG believe that the bride is Zhang Gil Jah or the “mother god”? Did Ahnsahnghong, in any of his writings, ever describe the bride as a single person, a god, a mother or anything other than the church? If a WMSCOG member can produce documentation to support that Ahnsahnghong, in his own writings, believed that the bride represented anything but the church, I am open to correction, but until then let the record show that Ahnsahnghong never preached anything about a “mother god”. Despite the lack of evidence to date to support that Ahnsahnghong himself believed that the bride in the Bible represents the “mother god”, the WMSCOG claims that “the One who is indispensable for giving eternal life is our Mother, the wife of the Lamb, represented by Eve”. © WMSCOG English WATV.org – Accessed on 05.13.2011. This would have been a good opportunity for Ahnsahnghong to mention that there was a “spiritual mother” if he in fact believed there was one, but he didn’t. “Those who do not believe in Mother can’t receive the promise of eternal life and the kingdom of heaven”. © WMSCOG English WATV.org – Accessed on 05.13.2011. “I am the resurrection and the life. The one who believes in me will live, even though they die (John 11:25). The WMSCOG goes on to say in the above referenced sermon that “God…has acknowledged us, who are following Mother in this age, as those who have the best faith”. A bit pretentious wouldn’t you agree? 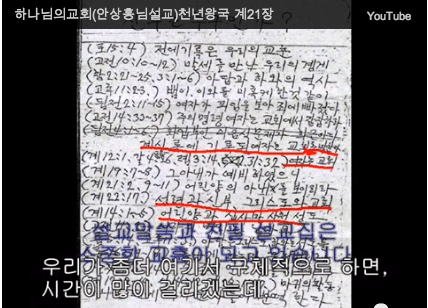 Was Ahnsahnghong Ever Married to Zhang Gil Jah? This “spiritual marriage” between Ahnsahnghong and Zhang Gil Jah has been a matter of controversy among many former members and critics. In fact, some former members and critics have alleged that Ahnsahnghong and Zhang Gil Jah had divorced their respective spouses prior to their establishment of the WMSCOG. If it were true that Ahnsahnghong and/or Zhang Gil Jah have a history of divorcing their spouses at any point, would that not disqualify them both for being “god” according to the Bible? Absolutely. The bible clearly testifies about Heavenly mother. (Rev 22:17) The Spirit and the birde say “come” And let him who hears say, “come” whoever is thirsty, let him come; and whoever wishes, let him take the free gift of the water of life. In the last days the Spirit and the Bride give us the water of life which is eternal life. So we can understand the Bride is God Almighty. 1. The bride in Revelation 22:17 clearly refers to the church, and not to any “mother god”, because the Bible everywhere refers to the church as “the bride”. This was pointed out in the original article above. So your task with Revelation 22:17 is to demonstrate why the term “bride” in this verse does not mean “church”, when everywhere else in Scripture it is constantly used as a metaphor for the church. As Ahnsahnghong says in The Mystery of God and the Spring of the Water of Life, “we must let the Bible interpret the Bible”. Interpreting this verse here as anything other than “the church” does violence to the metaphor used throughout the Bible, as well as Ahnsahnghong’s own directive. The interpretation of Rev 22:17 is that Jesus, who cried out on the last day of the Feast of Tabernacles 1,900 years ago, will come again in the flesh and cry out. So, on the one hand Ahn Sahng-Hong, the man the WMSCOG claims is the second coming of Jesus Christ says it means one thing, and on the other hand, your argument says it means something else. Do you see the problem? Ashnsahnghong says that Rev 22:17 refers to “Jesus Christ”, and the argument you raise says it refers to a “heavenly mother”. I guess if we want to follow Ahnsahnghong, I’d have to say he has already proven that argument wrong. So if we want to listen to Ahnsahnghong, then Rev 22:17 refers to Jesus Christ and not to any “heavenly mother”. is that it? I’m sure there are other verses in the bible that proves your opinion, right? If not, f*** off and get out of that damned church because the next thing you know, they will be ordering you to commit suicide when your “mother” died. You just have a misunderstanding. Nowhere in his books, or sermons does Ahnsahnghong indicate that the bride is the church. In no way, shape, or form does that interpretation of the verse make any sense. A bride will never mean a church. Not now, not tomorrow, and not ever. If you want to discuss this more, we can. But first, read about the Heavenly Wedding Banquet in Matthew 22, then Rev. 21 followed by Galatians 4:26. It says Jesus will come in the flesh again and cry out.. that is followed by a verse in John stating “Your word is truth”. Jesus was crying out the truth. When Jesus cried out at the Feast, he was teaching about the truth (John 7). When he comes a 2nd time, he will cry out the truth. Meaning, he will teach about the truth, crying out for his children. John 1 states that God’s children are not born of natural descent, or human nature, or a husband’s will.. but born of God. Hello DavidsOffspring and thank you for commenting. You stated “Nowhere in his books, or sermons does Ahnsahnghong indicate that the bride is the church”. 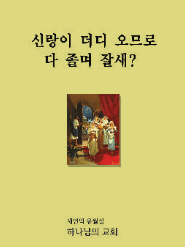 But in the above article you can see the direct quotes from Ahnsahnghong’s books where he describes the bride as “the saints who are redeemed can be called the last Eve” on page 55 in “Visitors From The Angelic World”. This is Ahn saying that the bride is the church. Do you have a copy of the book that you can reference so that you can see it for yourself? 2 I am jealous for you with a godly jealousy. I promised you to one husband, to Christ, so that I might present you as a pure virgin to him. 3 But I am afraid that just as Eve was deceived by the serpent’s cunning, your minds may somehow be led astray from your sincere and pure devotion to Christ. 29 After all, no one ever hated their own body, but they feed and care for their body, just as Christ does the church — 30 for we are members of his body. 31 “For this reason a man will leave his father and mother and be united to his wife, and the two will become one flesh.” 32 This is a profound mystery—but I am talking about Christ and the church. Clearly the church is referred to as the bride in these verses. Note that Paul says “your minds” when speaking to members of the church. Now, we are quickly bringing in a lot of additional verses. I would encourage you to mention these as separate posts in our forum so that we can further discuss each one. I would be very interested in studying the arguments in more detail so we can clear up any misunderstanding. As a quick follow up though, in regard to Galatians 4:26, please see this article, and for the wedding banquet in general I would recommend this article. Also, please specify which verses in Revelation 21 you are referring to. You stated, “It says Jesus will come in the flesh again and cry out.. that is followed by a verse in John stating…”. Can you please expand on this more? It would be helpful if you could start a separate topic for each of your points in the forum. That way we can address each of the points accurately and the focus of the questions will not be lost. Hi jessa. Where has the WMS said this? this explanation should clear things up. Funny how these wmscog members keeps popping up into the forums and leaving comments and when directly confronted, they just vanished into thin air. No comebacks, no anything. they SHOULD be dead by now.